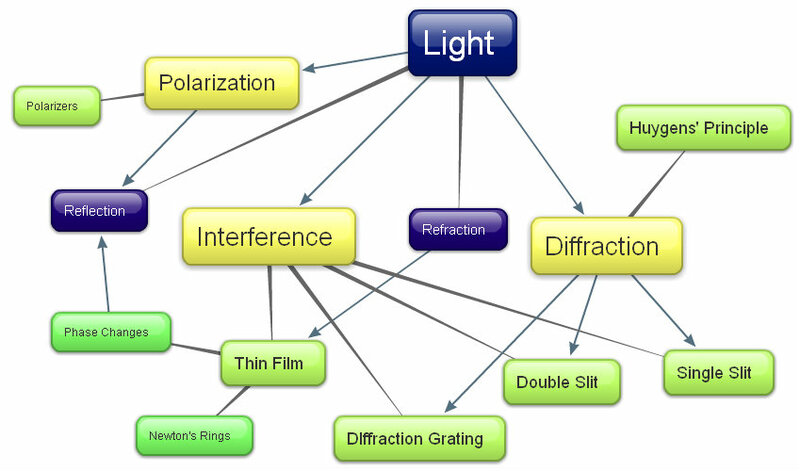 Interference and Diffraction in a Nutshell. A wave-interference phenomenon occurs when light passing through one slit interferes with light passing through another slit. The result is a pattern on a screen placed a distance away from the slit. The bright fringes of the pattern (right) are where constructive interference occurs, while the dark fringes are where destructive interference occurs. Every half-wavelength the fringe goes from bright to dark or vice versa. A diffraction pattern exists around any sharp object illuminated by a point source. Light diffracts after encountering an obstacle; a detailed reason can be seen in the Extras section under Huygens' Principle. A large number of equally spaced parallel slits through which light can travel. Once again, a pattern is formed on a screen due to diffraction. Light that travels through the film before being reflected must travel a long path than light that is directly reflected by medium 1. A viewer sees a bright surface when the waves arrive in phase (constructive interference) while seeing a dark surface when the waves arrive completely out of phase (destructive interference). Sometimes, the waves change phase by 1/2 cycle upon reflection. Waves undergo phase changes when reflected by a material with a refraction index greater than that of the material in which it is traveling. Newton's rings (pictured above) occur when interference between rays reflected by two pieces of glass with air trapped in between. A wave is said to be polarized or plane-polarized if its oscillations are limited to a single plane. Light originally travels in all directions, but it can be limited to only oscillate in a single plane. Light is polarized when it travels through a polarizer. Its intensity is also reduced by the polarizer. Light can also be polarized by reflection, when light strikes a nonmetallic surface at any angle other than the perpendicular. Chapter done by Justin Tzeng.